There's something both uplifting and depressing about spotting your own behaviour patterns. On the one hand I think, "Great, I've realised that I do that - now I can change it and I won't behave the same again." But on the other hand, "Am I really that predictable? That's such a bad habit to be in, and it's so ingrained. I'll probably always act like that." After writing about my new challenge of training to swim 5k, I've been a bit ill and run down. Nothing serious, just enough to keep me at work but barely managing anything else. In the last two weeks I've managed precisely one swim and one ballet class, neither of which went particularly well. That in itself is fine. People get ill. It's best not to train whilst feeling ill, and a week or so off a training schedule doesn't cause failure. The problem is that it's taken me longer than it should have to get back into training, and I've felt much less motivated to train. When I trained for the marathon, I started well. I researched lots, I ran three times a week and happily logged the times and distances. Then it started getting harder (and quite dull); I realised that I wasn't very good at running and I got lazy. I was full of excuses. And we all know how that ended. (In case you don't, here's the link). Then there was the half marathon. I did prepare better for this, but I still hit a point around halfway through when I was tired and fed up (and scared of failure) and I let my training slip. This post explains the situation, and is full of excuses. In the end, I pulled it together better. 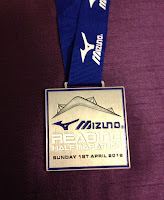 I got out for some decent training in the last few weeks and managed it (just): half marathon post. I think it's the pause in training, combined with realising exactly how hard it is going to be to train well and the fear of being unprepared, which results in my failure to be prepared for the events. How am I going to change this? Quite simply, I have to force myself to keep training. To do each session that is planned. I need to find a way to turn that fear into commitment to train rather than a reason to hide away. I need to be in the pool three times a week for the next seven weeks. and so it is blogged and so it shall be done? That's the idea :S Previously I didn't tell people when I was in training so this time I'm trying the opposite approach!